The solution seems simple, but I'm unsure of how to proceed with the two disjunctions. If it were just asking for the second half of the main disjunction, not P or Q, I think I could crack it, but my solutions for the posted question, P or (not P or Q), quickly become unwieldy and, in a word, ugly, which is not something you want from these things. Any help would be much appreciated. Although a truth-table would show that this is true for all truth values of P and Q, the question asks for a way to proceed with a derivation. Not the answer you're looking for? 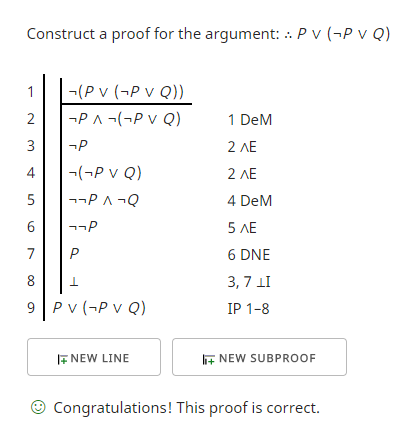 Browse other questions tagged logic deduction symbolic-logic propositions or ask your own question.